My otherwise adorable grandchildren handed off their “yuckies” over the long weekend. Little runny noses caught up with larger noses. Consequently, I spent the better part of Sunday in bed, trying to sleep off the bug. Today I foolishly went in to work. Usually a day in bed knocks the punch out of whatever I have that’s got me down. It’s how I cope with being sick: crawl into bed, drink plenty of fluids, and sleep a lot. It hails back to when I was a 6th Grader and my stomach hurt every morning at 7AM and didn’t stop hurting until 3PM. I spent most of the school year sequestered in my bedroom, cutting out paper dolls and wondering if I was a true invalid like the tragic heroine in some novel I’d just read. I was neither tragic nor invalid: I was a scrawny picked-on little girl who preferred hiding under the covers of her bed to facing the Lord of the Flies mob that buzzed ceaselessly around the junior high doors. My father grew increasingly exasperated. My mother faithfully hauled me in to see Doc Hartoch. Doc drew blood and declared that I suffered some unknown ailment. I think he knew what ailed me, just as my mother and father did, but they didn’t have the ability to help me. I learned two lessons that year. One was how to help myself. And the other was that if you claim you are sick, then you stay in bed and act sick. I’m half way through a mystery novel that I started on my lunch break. Sickness does that, too: speeds up the time it takes to read a cheap novel. My head is still stuffy and something tells me that tissue will be a close friend for a few days. I have about 8 hours of sleep still in me, so I will retire soon so I can get up tomorrow and feel like I want to go to work. If I don’t, then I will stay curled up in bed, dozing intermittently. I won’t cut out paper dolls. And if you really want to know how I conquered that 6th grade fear, then you’d have to know about Mrs. Haskell. She said things like “alfa-alfa” (“alfalfa”) and she loved teaching history. More than that, she recognized a kindred soul when she saw one, and Mrs. Haskell single-handedly provided me with the tools to stand up to a bully and never back down. She gave me permission. The classroom twittered and I realized I had POWER. Later on in 6th grade, I nailed Danny-whose-name-shall-not-be-mentioned in the face with a lunch pail. Actually, I just held it out in front of me in self defense and he rode his bicycle smack dab into it. Blacked his adorable little eye. I ran away, laughing hysterically. I started to laugh. “Oh, my goodness, no! It was the funniest thing I’ve ever done in my life,” I crooned. So now you know why I never let a bully stand in my way and why I crawl under the blankies when I feel sick. All about the same darn year. And both very effective defense mechanisms. Thank you Dad and Mrs. Haskell. Great post! Sorry to hear you have the yukkies and hope you mend quickly and completely! Hope you are feeling better, Jaci! Thanks for the emails. I am hoping 2010 will be a better yr! 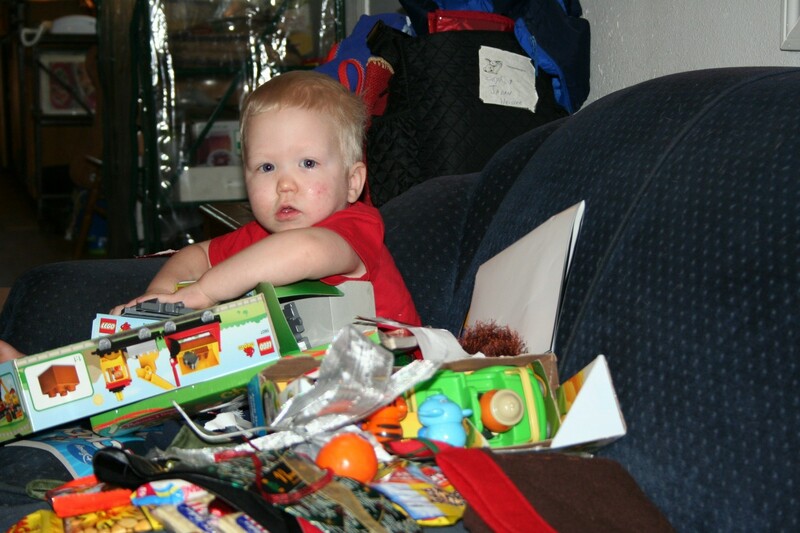 Cute pic of your little grandson with his packages! Teri – 2010 WILL be a better year. I am so glad to “see” you! You are never far from my heart. Thank you for the well-wishes – can you believe we have one more day of 2009 left? ?